The Cobra King F8 One Length hybrid has been reengineered to match 7-iron weighting, lie angles, and length for more consistency trajectory and distance gapping. The high strength 455 stainless steel face maximizes face flex for increased ball speeds and distance across all points of the face. 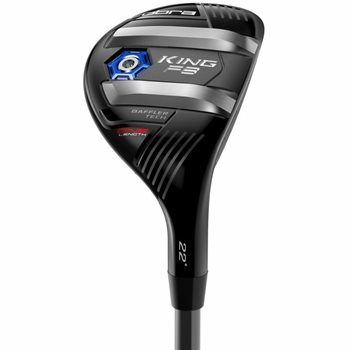 The King F8 One uses Cobra’s Baffler Rail Technology to provide improved versatility and forgiveness from any lie while Multi-directional Crown Aero technology improves drag reduction face-on through the downswing to generate maximum clubhead speed. A fixed, interchangeable weight positioned low and back results in a high, towering ball flight for maximum carry distance and forgiveness. Cobra Connect Powered by Arccos, allows you to track their performance to improve your game. First impression right out of the box was the weight. Much heavier than I expected. Took it to the range and hit with it. Fella next to me was hitting Cobra so I talked to him about his clubs and he got out his F7 hybrid which was feather light. Second impression was how short it is because of the one length. Mentally a bit to get over but it is One Length so I got over it and hit the heck out of it. Wow, let the weight do the work and you will be awed by the technology. First new club I bought in this set and it was worth it. I bought the One Length irons from global - used - but new by all appearances - typical of Global. Nice head cover too. All in all the One Length is the way to go for recreational players. Forget all that traditional **** and give yourself a break so you can enjoy the game. I did and I am having great fun on very good courses with one swing stabilized. These hybrids feel very short when first setting up to them and the tendency is to over swing but there is no need . Swing like you would a seven iron and they will go the distance of a regular hybrid of equal loft but with increased accuracy, at least it is for me . Extremely easy to hit and you play it like a 7 iron. Very well built. One of my favorite clubs in the bag. Bit of a learning curve for the one length hybrids. You may top it the first go around. Heavier than my standard length hybrids and plays maybe 1/2 a club shorter.